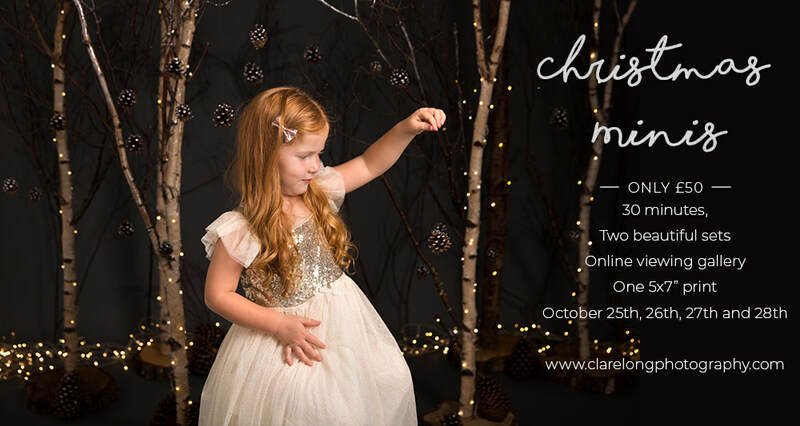 Four days of sparkly photoshoots, perfect for Christmas cards, gifts and amazing memories to look back on. These sessions are designed with unaided sitters in mind. Younger babies can be included if an older sibling can support them. If your little one cannot sit completely, but is good on their tummy we may also be able to complete the shoot - please contact me prior to booking. Siblings are just perfect in these sets, a mixture of happy smiles (you will be amazed at what I can get!) and playful interaction will give you the best choices! Each session is 30 minutes long, allowing for both set ups - one a modern, light set, the other our woodland set, interactive, glittery, so much fun for your little ones. You are able to bring 2 outfits to wear - one for each set. Up until and during your shoot you will have the opportunity to purchase a discounted package (details below) these are on offer up to the end of your shoot. After this normal prices apply. 2 weeks after your session you will have private access to an online gallery from which you can choose your digitals, prints and any other products you may wish. Sets may vary slightly up to the shoot. Sessions cannot be reserved without payment. All digital orders are final.